Constantine travels all over the world to recover (or steal) artifacts, that can be used for evil if they land in the wrong hands, and secures them in a safe location. The occult detective lets nothing get in his way while on these perilous journeys. Often being followed and captured by his enemies, Constantine finds a way to free himself from his captors every time. He acquires the magical assets, using whatever means necessary, even if at the expense of innocent lives. 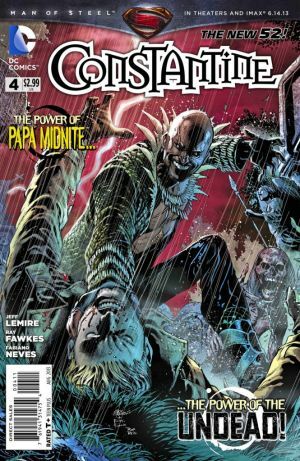 In this issue, Constantine steals an artifact from Papa Midnite. A voodoo sorcerer and leader of a vicious street gang, Papa and his goons intend to make Constantine pay. SEVERELY. This series is fast paced, but not hard to follow if/once you are aware of what is happening in the story. I was confused after reading the first issue, but that was because I went into the story blindly. I knew nothing about Constantine at the time. I was addicted by the end of the second issue. Ray Fawkes and Jeff Lemire are the creative writers of this action filled series. I like how Constantine’s use of jokes and trickery intensifies the anger in his enemies. I also like the fact that he is known and recognized, by his enemies, as a sorcerer of great skill and power. Fabiano Neves is the artist and Marcelo Maiolo is the colorist. I love witches, wizards and monsters. And I love dark. Neves and Maiolo provides all of this. An excellent team of visual storytellers. I enjoy following the adventurous travels of Constantine, a clever, cynical, deceitful, manipulative, cigarette smoking wizard. And since I love stories of sorcery and black magic, I definitely plan to continue reading this series. I still recommend this New 52 title by DC Comics. It was suggested I try Justice League Dark after I became hooked on Constantine. I grabbed the current arc from the comic shop and bought all the back issues at a convention last month. So now that’s on the list. I’m sighing with you! Let me know if you give it another shot and how you like it.